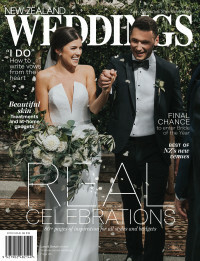 Ahead of the New Zealand Weddings Magazine Collection at Fashion Weekend, we spoke to Jamie Richards – creative director and owner of Margaret Wray Bridal. The 2019 Margaret Wray collection is new and refreshed, maintaining traditional elements with an ethereal feel to the the silhouette. Creative Director Jamie Richards believes that a wedding gown should empower a woman, and truly show her personality and strength. All of her pieces focus on the modern woman and take a contemporary approach from the dress, the ceremony and reception, and everything in between. We caught up with Jamie as she prepares her gowns for the catwalk, to find out more about what inspires her. What are you most excited about for your next collection? I'm excited each season, but this year in particular as the Margaret Wray brand has relocated to New Zealand, this being my first home gown collection after opening my studio in Central Otago. Bridal has also had even more focus due to that little royal wedding earlier this year. It’s a year of traditions going out of the window – people are becoming more creative and curating events that are personal to them. I have really played around with tradition and modernity. A traditional shape has an unusual layering of fabrics and textures or a structured silhouette is juxtaposed with softness and tonal colour within the collection really adds a new depth. I always love a bridal jumpsuit so I couldn’t possibly launch a collection without one and this year it is very new, structured but complemented with a unique twist. To be yourself, and be proud! A wedding gown needs to fit you, your personality and your body shape. There is no point trying to force a style because it’s a key trend, trends can be tailored to work with you and your silhouette. When you’re not busy designing beautiful gowns and running a business, what do you love doing? I spend a lot of time working, but when I do have free time I always love to spend as much of it with family and friends. Whether that is at home in New Zealand or travelling back to London to catch up with my friends there (I also can’t help but do some inspiration days while I’m there too). I love to be active so playing with my dog, doing yoga or a run along the lake edge allows me to clear my head and re-focus. Visit margaretwray.com and follow Margaret Wray on Facebook and Instagram.